It’s a good mix of games that’s been ranking high on the Top Downloads lists lately. Dissection in itself is a great exercise to learn the nitty gritty details of other games! Dissection in itself is a great exercise to learn the nitty gritty details of other games! We are doing this because other developers were constantly asking us for growth tips after we successfully launched the Fun Run games as part of the Dirtybit team: How did you get those 70 million players organically? In this post, we are presenting our best practice list of what you as a developer can do to grow your player base organically. The best practice is based on lessons learned from dissecting the games above and our own experience from growing Fun Run. This post is only focusing on what you can do from within your game and not external factors like PR, user acquisition, etc. Our emphasis will be on the last part: Growth. We hope that these best practices will help any developer that want to maximize the potential for organic growth. Not a game developer you say? There’s still a lot of important information for you. Learning from games are more than including badges and rewards! Learning from games are more than including badges and rewards! Think about it: How often do you read an app description before downloading? Most players don’t read the description when downloading a new game, but for the ones that do, make sure to write a short description using max 255 characters above the fold (the read more breakpoint) that is short and to the point. If you absolutely need to write a wall of text, do it in a new paragraph below the fold, like Angry Birds 2 does. Players care about good videos and images on the App Store page. It’s usually the first thing players look at before deciding whether or not to download the game. All images are shown vertical on iPhone, so if your game is horizontal, convert the screenshots to vertical images and add text above or below them. It’s a lot easier for the player to read instead of flipping the iPhone 90 degrees. Also, make sure to show a nice and authentic presentation of the game. If you show graphics that gives the player the wrong impression of the game, you’re likely to experience higher churn. OBS: If you show devices in your video or images it’s smart to use iPhone for Apple App Store and Android devices for Google Play! #3 Keep the App Size Small! The app size is important for players. This might be intuitive for most, but yet we see too many apps not size optimized. Too large games can’t be downloaded over cellular networks and in addition you lose the market of low-end devices. 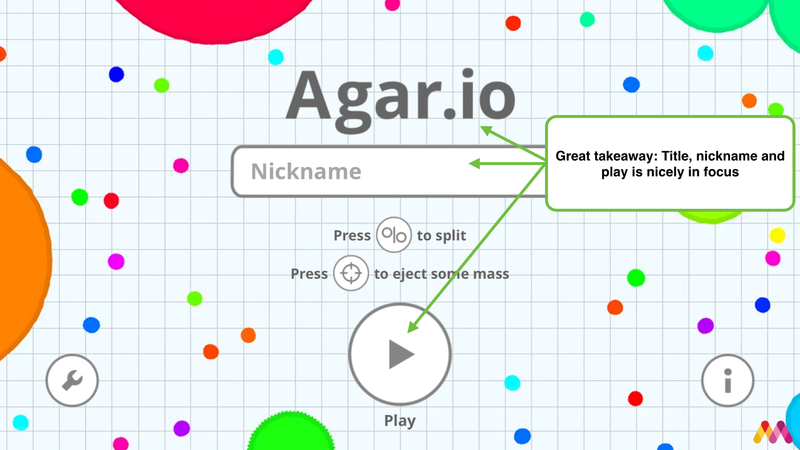 Agar.io has therefore a natural competitive advantage compared to i.e. Angry Birds 2. Throughout our careers, we have experienced a lot of different onboarding techniques. There is no right way, but there are a lot of useful tips to consider when onboarding a new player. It’s also super important to test this process. 80% of your players will only open your app once. If we can take a guess, this is due to long sign-up time and tutorials when starting a new game. How can you avoid that? When downloading a new game, the player is looking to try your game as quickly and smoothly as possible. Unless you have been featured or are spending heavily on user acquisition, your growth is driven by some sort of word-of-mouth: Someone told them to download it and explained what the game was about. Then why, WHY, would you put your new and excited player through a tutorial and sign-up, and not straight into the game? You only have one shot to prove to the player that this is worthwhile their time! You only have one shot to prove to the player that this is worthwhile their time! With Fun Run we had the mantra to have few clicks to enter the game; type username, hit play and then quick play. The player was supposed to get into a game as soon as possible. We even A/B-tested the onboarding during soft-launch with Fun Run 2: with and without an interactive tutorial. It turned out that we had higher retention from players without a tutorial! We encourage all app developers to A/B-test whether to onboard the player straight into the game or to do tutorial and sign-up first. The result will guarantee surprise you! Of the games we dissected, both Agar.io, Crossy Road and Block It had a short onboarding. Angry Birds 2 took you through a long video and loading sequence before getting to throw some birds. They sneaky taught you how to play with new birds and abilities through the first 10 levels. If you build a game where the player needs an account to sign-up, make sure to make it as simple as possible. Apple prefers to feature games that use Game Center as log-in, but if you absolutely have to do your own sign-up, only ask for a username and prompt the player for password and email later. If the username is supposed to be unique, make sure to give suggestions if the player’s username is already taken. This all helps smoothen the onboarding for the new player and increases the chance for Apple Featuring. When Fun Run first launched back in 2012, we experienced a 30% drop-off when we asked for both username, password and email address upon sign-up. Don’t make the same mistake! In both Agar.io, Crossy Road and Block It, it was clear to the player how to get started, while Angry Birds 2 had a lot of buttons and moving elements that were distracting. Candy Crush Soda Saga made it hard to understand what your first move should be as there was announcements that didn’t make sense to a first time player. It should be so easy that the player won’t have to think when getting started! It should be so easy that the player won’t have to think when getting started! 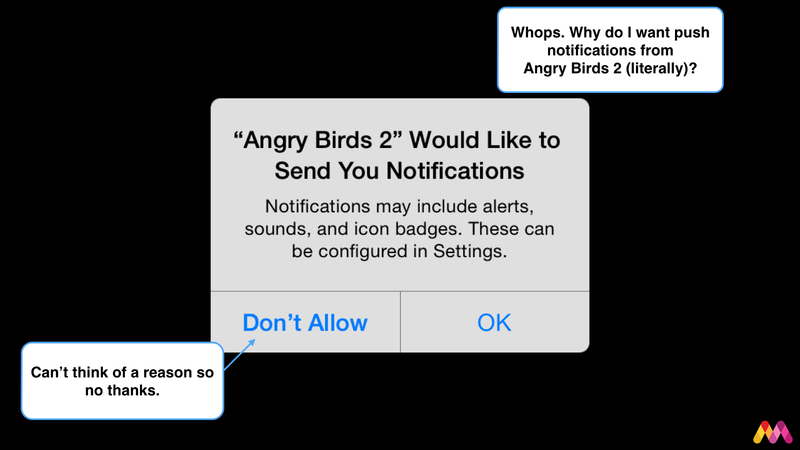 #7 Don’t Ask for Push Notification Opt-In Right Away! As players, we have never accepted to receive push notifications from games or services when it asks right after opening it. Why not wait until the player understands how it will benefit them? Players are sick of getting spammed down with notifications from different apps and games that don’t give them value. 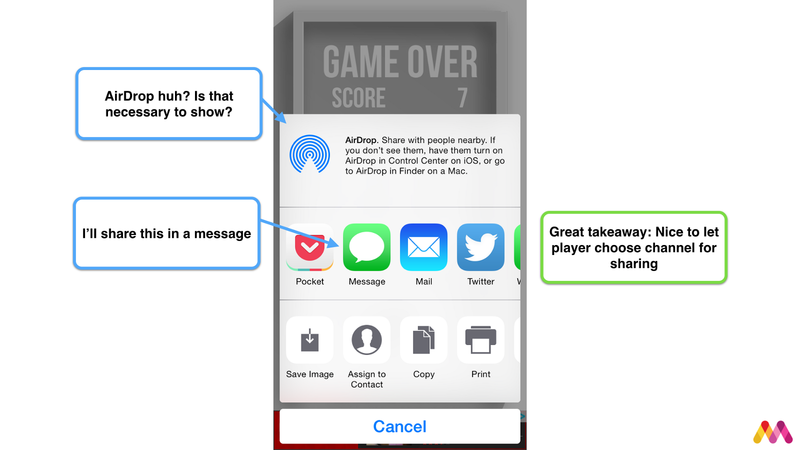 Chances are you get a higher ratio of opt-in for push notifications if you communicate clearly why it’s valuable to the player and not only for you. Both Block It and Agar.io have pretty aggressive ads in the beginning. Both seemed to mostly use them to cross-promote their other games, but it still felt too aggressive for a first time player. Block It shows an ad right away, while Agar.io sent two ads as messages when starting up, as well as showing ads between games. We assume that cross-promotion is the main growth driver for Ketchapp games, which is also why they’re always present on the Top downloads charts. “Good artists copy, great artists steal” — Pablo Picasso. From the very first version of Candy Crush, the positions of your friends progress have been visualized on a road of levels. This triggers competition to be the one reaching the furthest. It’s also a great incentive to connect to Facebook and to invite friends to compete for the best score. Both Candy Crush Soda Saga and Angry Birds 2 used the social road map. 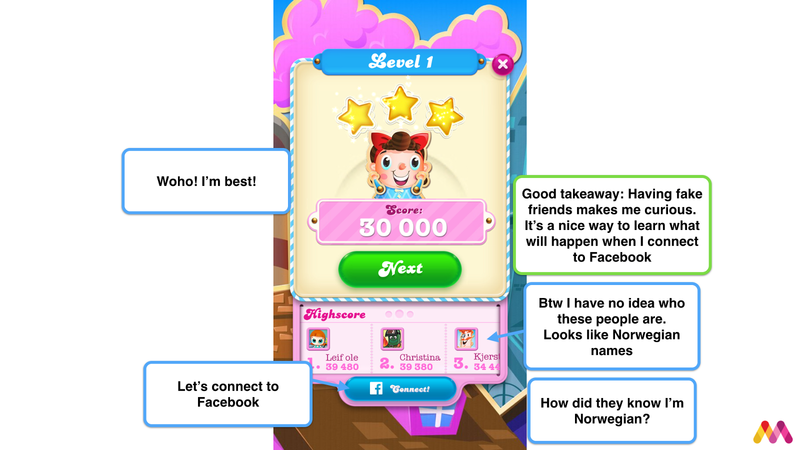 Candy Crush Soda Saga showed what appeared to be fake Norwegian friends as placeholders on the high score list before connecting to Facebook. It made us stop for a moment to wonder who these people were. It’s a nice way to learn what will happen when connecting to Facebook, instead of the blank list used in Angry Birds 2. The best way to organically grow is to have your players tell their friends about your game. New players invited through strong network connections are more engaged, have higher retention and monetize better. You want those players. Let’s look at some ways to leverage sharing from within the game. An important growth feature is to enable natural points within the game for sharing. Crossy Road has done a great job to implement non-intrusive sharing options in almost all scenes! Keep sharing in mind throughout the development process — don’t slap it on. Agar.io has something to learn from Crossy Road as there was nowhere to share from within the game. The only way is to say “Hey, download Agar.io. It’s spelled A G A R dot I O”. When being killed by a car or winning a new character, Crossy Road lets you share images of those moments. Players are more likely to share their experience with visuals than just text. Make sure to include an image with your sharing functionality! Leading with that, our most wanted sharing feature within Agar.io is a screen capture button added to the in-game scene. Due to its competitiveness, there are no seconds to lose to do it old fashionably. Or better, automatically capture the screen with the high score when you die, like Crossy Road does, to share. While on a wishing spree: GIFs are very popular and give you a better understanding of a game compared to a still image. None of the dissected games have this implemented, but it would be megacool to let players capture a GIF from a crash in Crossy Road or an unbelievable slingshot in Angry Birds 2. So our wish is to let players share a GIF of the last 5 seconds from a game. During this time they are usually in a highly competitive moment and they would like to share the GIFs to show off to friends. Be creative with pre-defined text for social sharing. By including pre-defined text, the number of steps to share is reduced and the likelihood of sharing increases. 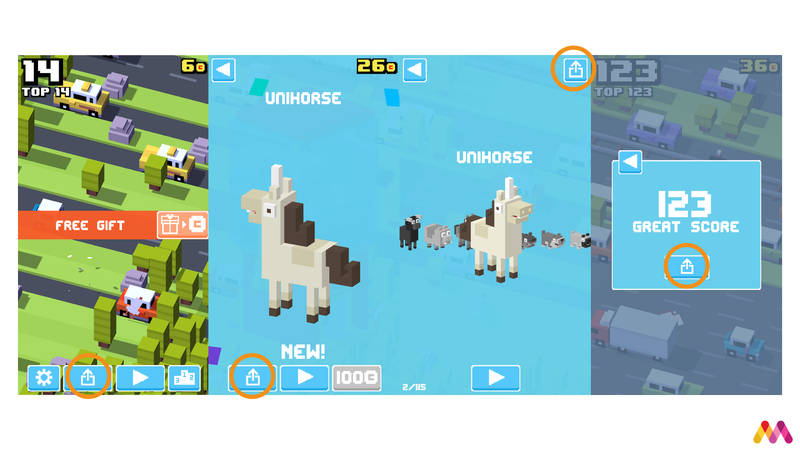 Crossy Road and Block It uses pre-defined text that is suggested when pressing the share button. Unfortunately, the text is static, the only change is the high score. We experimented with a pool of creative pre-defined texts for Fun Run 2. It increased sharing as the player wasn’t always posting with the same text, which made their audience more engaged, as well as they being excited to see which text they received. Remember to make pre-defined text that looks like it’s written by a human and not a robot! 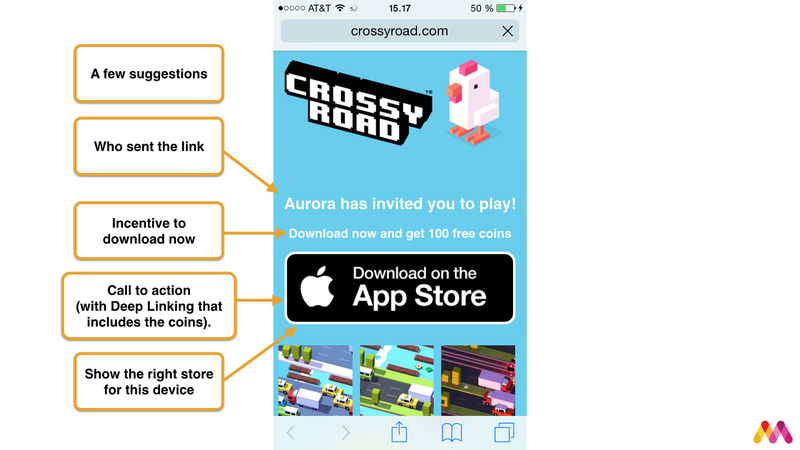 When sharing something using Twitter, #CrossyRoad and #BlockIt is included in the pre-defined text. Teach your players how to communicate about your game using a pre-defined hashtag. This will help your players find information and discussions related to your game. The chance of trending on Twitter increases with the more players communicating with the same phrase or hashtag, like we experienced with both Fun Run games. Just remember to remove it when sharing using channels where it’s not normal with hashtags, like in a text message. It will reduce the feel of authenticity for the recipient. This should be a no-brainer, but remember to include a link to your game when sharing. This is a great call-to-action so the recipients can easily learn more about the game and eventually download it. And while we’re at it, ALWAYS track your links! Use parameters to see which platforms are most popular so you can A/B test and optimize the onboarding route for new players. It’s also worth mentioning that by using deep linking the onboarding can be tailored to each new player. This is valuable when sending incentivized invites. None of the dissected games had trackable links nor deep linking implemented. As mentioned in the introduction, the most valuable players are the ones acquired by your existing players. They have higher engagement, retention and monetize better. Why shouldn’t you add incentives to prompt your players to invite more friends to join the fun? Some players don’t really think about inviting friends for single-player games. Why not remind them and ask them nicely? Make sure to answer their question: What’s in it for me? Suggestions for incentives can be to unlock new features like exclusive character, skins animations, or receiving lives, power-ups or in-game currency. Make the invite process super simple by using deep linking. If you absolutely need to point an invite/sharing link to you website, make sure to optimize it for mobile. Make the experience personal and show the right app store depending on device. Have a clear call-to-action of where the players should go next, like we suggested for Crossy Road below. Facebook used to be the place to share and invite friends (like Candy Crush Soda Saga and Angry Birds 2 still seems to believe), but today we are communicating on multiple platforms. The world is moving from social media to messaging. It’s, therefore, important to let the players choose which channel feels natural for them to spread the word depending on who he/she wants to reach. Facebook has been and still is a big part of the social aspect of games. When using Facebook App Invite, remember to use the latest SDK to improve the experience. 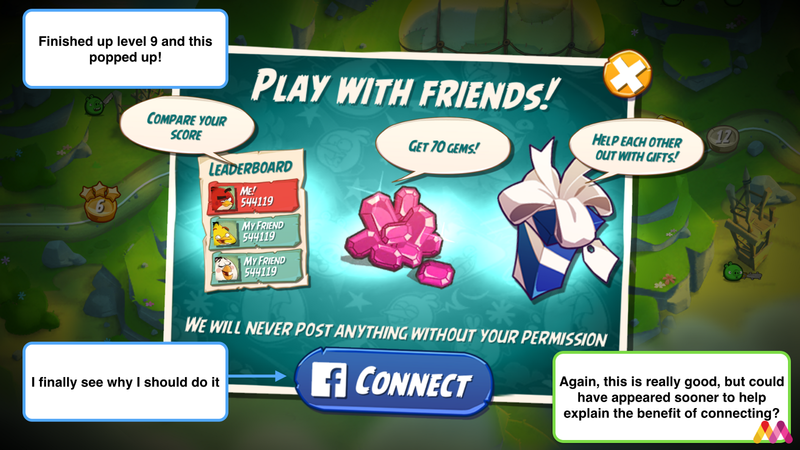 Both Angry Birds 2 and Candy Crush Soda Saga uses an old version, where the player is not allowed to add a customized message with the invite. The invite then ends up in the already spammed down game notification center on Facebook, instead of appearing in Messenger where it feels natural. If you want to be a little nasty, auto select all the players friends when inviting others to the app, like Candy Crush Soda Saga does. This is very effective, but not cool. You reach a huge group of people by sending an invite to all friends selected by default, either by the player accidentally or intentionally pressing the send button. Please, don’t do it! When prompting the player to connect with Facebook, remember to make that player understand why! 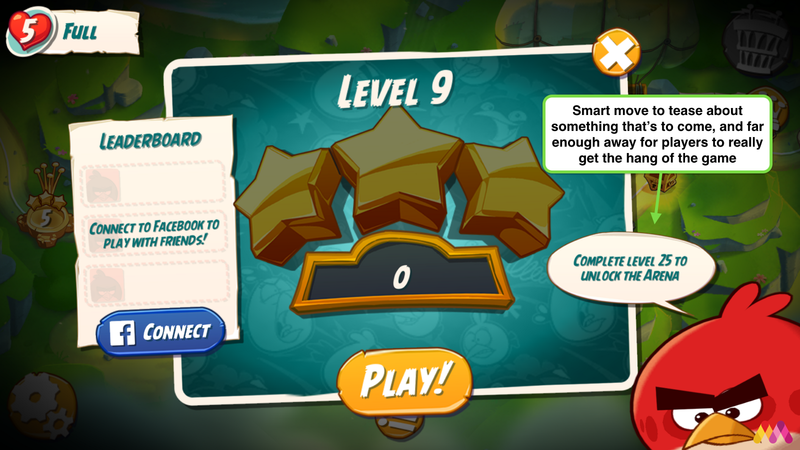 In Angry Birds 2, after reaching level 9, the player is finally told why and given an incentive: compare your score, receive 70 gems and be able to gift friends. If I would have connected earlier, would I have received my 70 gems? Why wasn’t that explained at an earlier time when prompted to connect? And as explained earlier, the fake friends as placeholders in the ranking list is also a good way to communicate what will happen if you connect with Facebook. 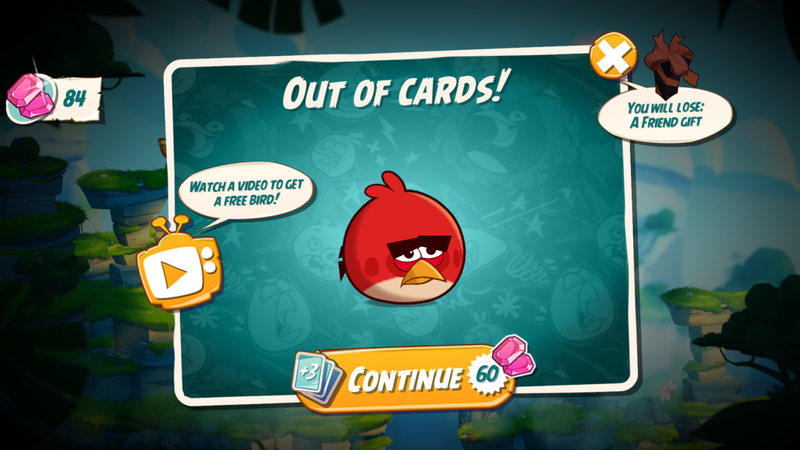 When the player is out of cards, Angry Birds 2 let’s the player choose to either watch a video ad or pay to continue. We experienced a feeling of joy when we could choose to only watch the video ad instead of paying. Instead of randomly asking “Please invite friends”, Candy Crush Soda Saga gives players two choices when they have no lives left: Either ask friends for more lives or pay for it. To have a choice is a strong monetization mechanism. A suggestion for choices in Crossy Road and Agar.io is to either let the player play X number of times to unlock a special character or skin, or invite a friend. Multiplayer games have a natural competitive edge to single-player games when it comes to growth: If a players really enjoys the game, they will invite friends to play with or against them. In one way, you can argue that both Angry Birds 2, Block It, Candy Crush Soda Saga and Crossy Road have multiplayer features where you can compete with friends for the highest score. When talking multiplayer games, we differentiate between asynchronous and synchronous games. A typical asynchronous game is when you make a move and than have to wait for someone else makes a move, while synchronous multiplayer games happens in real time. There are not a lot of big synchronous mobile multiplayer games out there, as it’s hard to create a stable experience over a mobile network connection and you have to play at the exact same time. A few examples are Agar.io, the Fun Run-games from Dirtybit and SpaceTeam by Henry Smith. When you see people play engaged together in public spaces, like a high-school or university, you are likely to want to join and experience the same fun. By having people compete in Agar.io, the level of competitiveness is high and it spreads easily. We saw the same growth driver when we launched Fun Run. 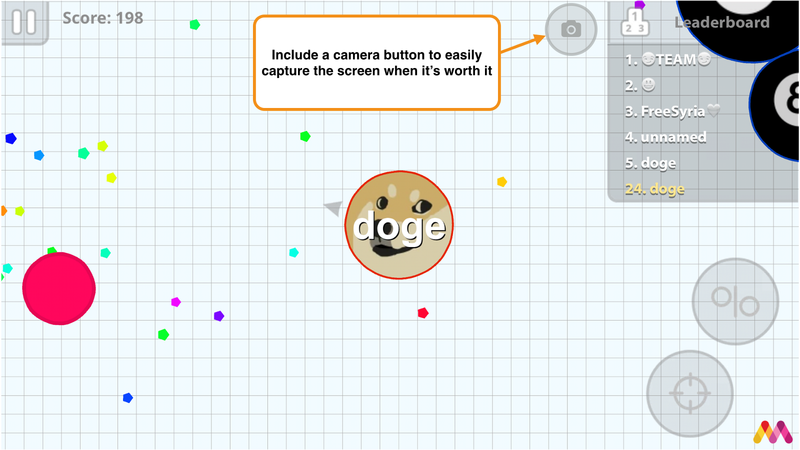 Agar.io is a competitive endless game, where the winner takes it all. When a bigger cell eats you after spending 15 minutes growing your own cell, it feels super frustrating. Strong emotions lead to increased sharing. Both Crossy Road and Block It have elements of frustration. The game has no instructions leading to natural questions like “How can I get the Doge?” or “How can I attack the big cells?” Secrets make friends talk and knowing the answer to these questions increases your Social Currency: we share what makes us seem smart. Letting players ask these questions to friends and spread the word is a brilliant move. Crossy Road is also know for it’s secrets, though we didn’t play long enough to identify them. When a player has completed a level, the only natural next step is to hit ‘Next’. 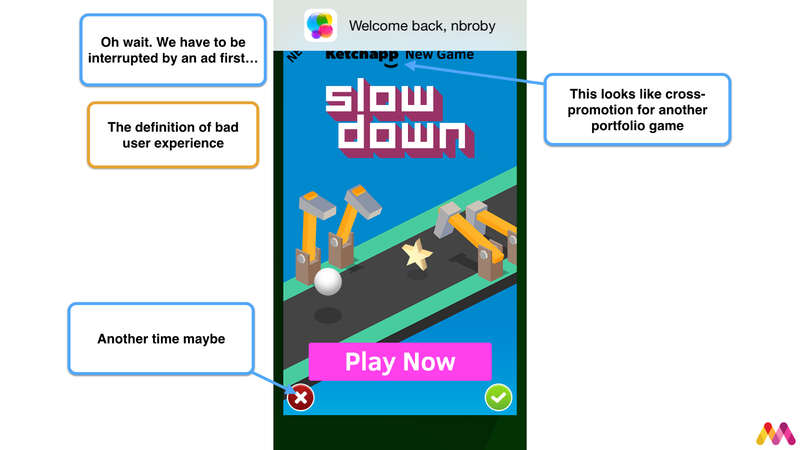 An animation takes the player back to the road map, automatically moves the player to the next level, opens the next game pop up with a clear call-to-action: Play! This is a very powerful engagement mechanism which keeps the player longer in the game session. Angry Birds 2 is teasing from the very beginning about the arena starting at level 25. This is a smart move to encourage continued playing, which improves retention and make players get the hang of the game while reaching level 25. Thanks for reading — Stay Megacool and sign-up to our newsletter to learn from more dissections! Megacool is helping app developers to boost their organic growth with GIFs and incentivized invites. Sign-up here. Prior to founding Megacool, we successfully launched the Fun Run games with over 100 million organic players as part of the amazing Dirtybit team.